Many of my transceivers use this stage and it has proven itself over and over to be a basic buidling block of the N6QW projects. I even have programs stored in my CNC Mill computer where I can simply call up the software and cut a new board. There are variants of the board manily in how the board is interfaced into the project. One variant most frequently used has three small relays so that signal routing is automatic especially in topologies where this board is ahead of a SBL-1 that is used for both the transmit and receiving mixer stage. The arrangement for the LM373 uses a single direction pass versus a bilateral approach and therefore the relays are not needed. So this time all we need is the amplifiers and no relays. The powering on off of the stage depending whether it is receive or transmit is all that is needed. 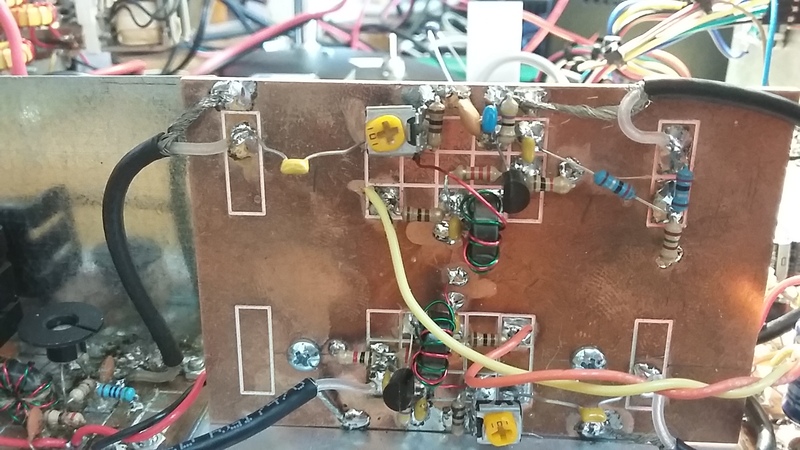 I did some circuit evalauation of this amp cicruit as used in the LM373 rig by employing a LT Spice simulation and that information is here. The amps are nearly identical except I did include a 50 Ohm 3 dB resistive pad on the front end of the transmit leg. This was to address any stability issues and the pad is simply inserted between the output of the Transmit Band Pass Filter and the input to the stage. The photo below shows the two amplifier stages. Oh I adopted a convention long ago --anything transmit has yellow wiring for the power and anything receive has orange for the power. Very quickly I know the upper amp is the transmit leg and you can readily see the "T Type" 50 Ohm resistive pad comprised of two 8.2 Ohm resistors and one 150n Ohm for the parallel leg. You can see the emitter bypass capacitors at the very top which s a 2200 in parallel with a 470 PF ~ 2700 PF. The 100 Ohm trim pot is about 1/2 gain so about 12 dB from the stage. Just in case you are confused as how this board is integrated into the final transceiver configuration then wonder no more. This pictorial show how to connect this board into the final scheme.